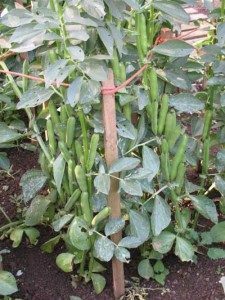 It is worth putting string round broad beans & tying to a stake if they are growing on fertile soil, as they grow tall and tend to fall over in heavy rain or wind. 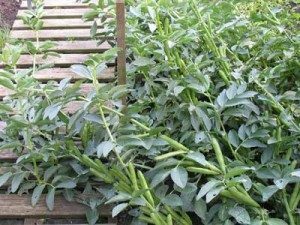 When the broadbean plant blows over it ‘lodges’ with other broad bean plants and stays close to the soil. Some of the leaves will be hidden from bright light so the broad bean pods will not be fed so well which means that they will not grow and fill with good sized broad beans. The beans in the picture lodged at a late stage in their growing period, so will provide a decent harvest. But if the lodging had happened at flowering time, the broad bean pods would not have filled properly. 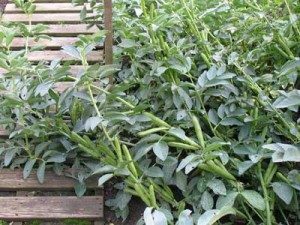 The broad bean plants are quite heavy, particularly when wet from rain, so it is worth putting some string round them to stop them falling over.